A temporary Packet first hired in 1812 when Captain Furze received a Commission dated 4th May 1812. Captain Caddy, Master RN, received his Commission on 17th July 1813, ‘vice Furze, removed by owners’. Captain Richard Dunstan who received a commission on 12th June 1818 subsequently succeeded Captain Caddy. The identification flag shown at the fore was originally allocated to the Princess Augusta. 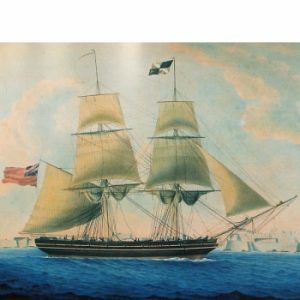 She appears to have had the same managing owner as the Swiftsure – the Post Office Commission Book records a commission for John Furze dated 11th October 1809 for the earlier vessel, ‘nominated by Mr. Angove in room of Capt. St. Aubyn deceased’ – and, as in other cases temporary Packets were assigned their own signal flags, it is possible she was used as a replacement vessel for the Princess Augusta when that vessel retired from service, there being no record of her having been lost. In any case Captain Furze clearly transferred to the Swiftsure in 1812 and took the signal flag with him. It is known a new identification flag consisting of a blue St. Andrews cross on a yellow ground had been assigned to her by 1819. This is the only painting in the collection to be signed with the forename Nicholas in addition to the family name Cammillieri. There are some distinct differences of style between this painting and that of the Countess of Chichester which is merely signed. N. Cammillieri. For a start, the lettering of the cartouche in this picture is in a rounded copperplate script whilst that in the Countess of Chichester portrait is in a gothic style. The draughtsmanship in this picture is superior with the modelling painted more strongly. This is particularly noticeable in the treatment of the sky. The crew members are well animated being shown giving orders and carrying them out as they work the ship. Although drawn a little under scale – they represent a waterline length of about 110 feet – they are closer to true scale than in the other paintings.